Reports from around the world have been detailing data theft from banking and messaging mobile apps, including Whatsapp, Facebook and SMS services over the last few months. These attacks are especially complex in the way they take advantage of unsuspecting users, which includes stealing sensitive data, intercepting messages and taking over users’ personal accounts. Although there are multiple reports from renowned entities within the banking, security and media sectors, there is a shortage of details that prevents users from fully understanding the magnitude of this increasingly troubling situation. Our goal is to shed light on the matter and remediate this. 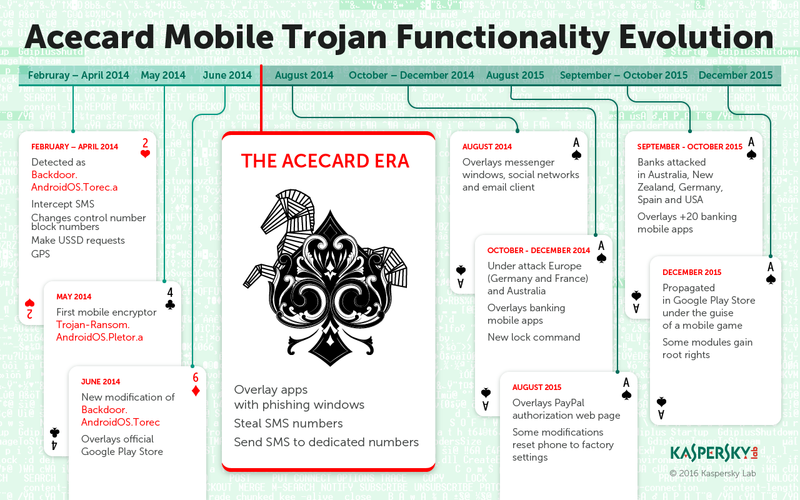 Acecard is a malicious mobile app (also known as malware) that affects devices equipped with Android 5.1 (Lollipop) or lower, regardless if they are rooted or not. This app is extremely hard to uninstall and its main objectives are stealing other apps’ access credentials, such as online banking credentials, and intercepting the device’s messaging traffic. Mask codes: These are hidden code blocks which seem normal until they are inspected more closely. Vulnerabilities in the development API that allow a third party to monitor and modify other apps installed on the device. When launching attacks, cybercriminals leverage three major aspects of the malware: app overlapping, device monitoring and a terribly difficult process to uninstall. Regardless of the smartphone model, unknowingly installing certain applications can expose users to malicious code, which has quite a bit of history according to Kaspersky Lab. When the app is being installed on the user’s phone, it requests administrative permissions supposedly needed by Adobe Flash Player. Once installed, the app’s icon disappears from sight, perhaps as a mechanism to prevent uninstalling it, and if users try to uninstall the app through other means, the option will simply not be available. Some users even attempt to disable the administrative permissions originally granted to the app, but this only makes the problem worse. In this case, the app would incessantly display a warning message asking the user to reinstate said permissions, rendering the phone almost useless. 2. Deactivate administrative permissions for Acecard. 3. Wait for an Acecard pop-up window. One of Acecard’s most infamous features is the ability to display windows and boxes that simulate the normal behavior of legitimate apps (overlapping). Acecard does not close, replace or modify the original app in any way (due to the API’s limitations); instead, it acts as a thief lurking in the shadows, ready to impersonate a banking customer. The user has several apps on their device. One of them has embedded malware. The user opens a legitimate app included in the malware’s target list. The app starts normally and prepares to display its home screen, including forms and other details. The malware detects this process and intercepts it with its own home screen, which looks exactly like the original one. The fake window requests sensitive user information. Once the user has entered it, normal operation is resumed without the users ever knowing that they just provided valuable information to a criminal app. These types of permissions allow malware to gain control through commands (C&C) display onscreen notifications and receive instructions via hidden internet services, usually Deep Web servers (TOR). The only solution for users who have installed this malware is to reset factory settings, but this means losing all personal information on the device. Even though Google Play Store has already identified the app where Acecad is contained and is currently alerting users, it is also important to consider the very real possibility that Acecard is contained in other apps. For this reason, additional security measures should be taken, including always checking the permissions granted to new apps, being vigilant about strange or suspicious behaviors on smartphones (pop-up windows requesting permissions, apps installing without consent, icons not acting normally, etc. ), and verifying that there is only one window for entering sensitive information. It is also recommended to immediately report any doubtful behavior encountered to Google Play Store so it can be properly evaluated. These simple measures can help a great deal in the prevention of electronic fraud that is now so common on mobile devices. In this new era of information and communications, fraud will relentlessly continue to evolve to take advantage of our good faith and bank accounts. Overlapping happens almost instantaneously, although its execution times are directly affected by the device’s available resources. Jhoan Mauricio is a Software Engineering Expert at Easy Solutions. He has more than four years of experience designing, programing and testing software across a variety of platforms, and has worked on numerous projects related to detection and prevention of electronic fraud. His analytical and problem solving skills facilitate the development of new ideas and improve existing concepts.